I will be plain. I am not accustomed to dwelling in a house so pestered with strange folks. And dogs. I creep about most careful of my safety, but I see and hear much, you may believe me. We have not had merriment of late. 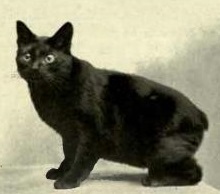 All must wear a mask of sorrow, whether they be sad or no, because the old Catlick lord [the Earl’s grandfather] has died. I hear tell he will have a fine house to lodge in, same as was built for my lord’s maggot-brained father. The tomb effigy of Anthony Browne, 1st Viscount Montague – the Earl’s grandfather, who died in October 1592. From a photo by Anthony McIntosh. What things they two learn from their mad mistress and her lawyer son. I entertain myself by watching my lord and his friends play at killing each other. They stamp up and down the gallery most murderous. Their claws are not fit for fighting, so they hold a dagger in one hand and a sword in the other. I count this a comedy, but they take great pride in theirselves. And I attend upon my lord. I’m not so familiar with him as I was when we were kits together and he first guided my untutored pen. But I believe we’re very like. We was both took from our mothers too soon. And he makes a great show of hisself (as some say I do). He loves his mirror, though not as Narcissus loved his pool of water. When my lord is content with what his servants have made of him, he comes away from his reflection most cheerful. But I do not believe he takes that image for his true self. Or loves what he thinks his true self to be. Perchance his self is at odds with his soul? I must think more on it. My education continues apace. I’m learning Italian, as the nobilitie do. And I know of Pie-Takers. 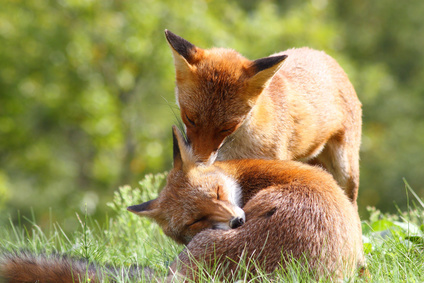 When first I heared that name, I thought they was a pair of thieving dogs or foxes. But no. This Pie-Takers [Pythagoras] was a flosser [philosopher] in the old time. He sayt that when you die your soul goes into a new body. That is called: met in sycosis [metempsychosis]. Today Nero came up in the garden like a black flower (if there can be such a thing) in hopes of a glimpse of our Earl. When Nero makes haste, he has a strange hopping gait. He says this comes from being so long at sea, where he trod the decks in wild weathers. I believe it is because he has no tail to weight his backside. “Well met in sycosis, friend,” sayt I, most wittie. “What flea has bit you now?” arrkst Nero. We sat a while. I told him what I’d learnt of the transmigration of souls. I sayt that when he was last in this world, he was a rabbit. As his gait proves. And my lord might have him cooked and tasted, so all might judge how much of a rabbit he is. Nero vanished like a shadow then. 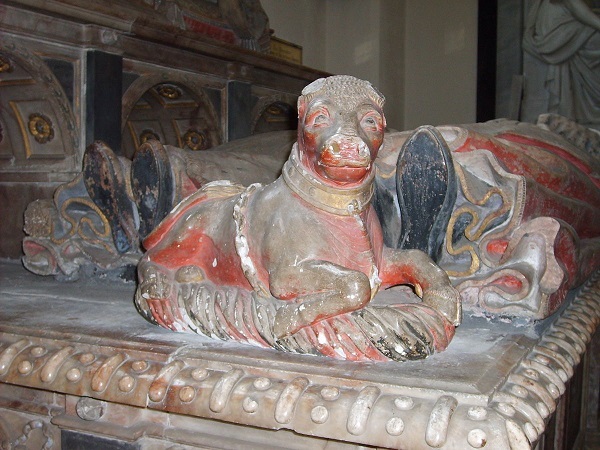 A detail from Viscount Montague’s tomb – a bull calf (?) at the feet of his wife. (Photo by Simon Burchell CC SA 3.0 via Wikimedia Commons). If Gib had seen the calf, he may have decided that it represented her next incarnation. There’s a handsome photo of the whole structure by Chris Partridge here. The tomb was damaged and rebuilt when it was moved in 1851 from the Montague Chapel in the Parish Church at Midhurst to the Church of St Mary at Easebourne.